Cook and drain pasta as directed on package, omitting salt. Meanwhile, in 2-quart saucepan, heat tomatoes to boiling. 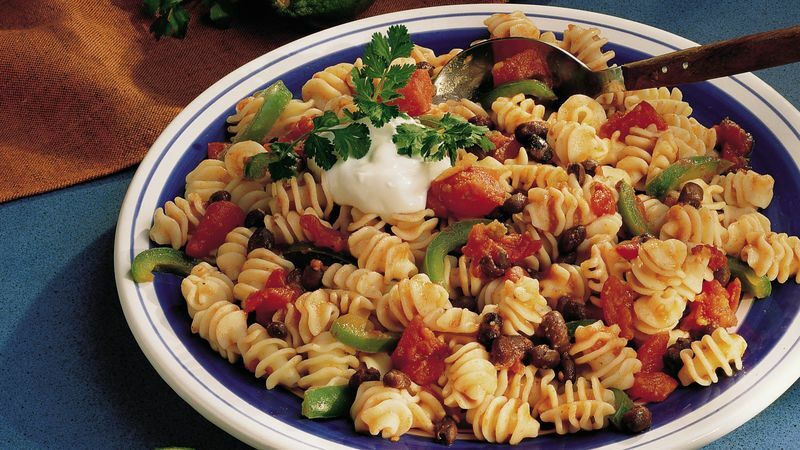 Stir in pasta, beans, lime peel, cumin and bell pepper. Reduce heat to low; cover and cook 2 to 3 minutes, stirring occasionally, until hot. Garnish with sour cream, lime and cilantro. Squeeze lime over pasta. Black beans are loaded with fiber—the soluble kind that helps to lower blood cholesterol. Start slowly so you have time to get used to more fiber. Diced tomatoes with chili spices or garlic and onions can be substituted for the tomatoes with green chilies.